WASHINGTON, October 23, 2015--McLain Ward and HH Ashley Top Gambler's Choice Costume Class; Taegan Long and Madison Goetzmann Win Junior/Amateur-Owner Jumper Speed Rounds. WASHINGTON, October 22, 2015--Katy Hamilton and Sacha 12, Tegan Elizabeth Treacy and Catalyst Victorious in 2015 WIHS Children's and Adult Jumper Championships. Thursday Night at WIHS Has Something for Everyone! WASHINGTON, October 2, 2015--Final 2015 WIHS Equitation and Hunter and Jumper Championships Leaderboard. 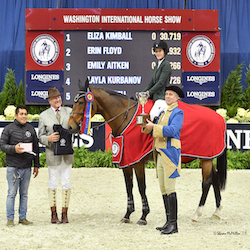 WASHINGTON, September 25, 2015--Attention Media: Credentialing now open for the 57th Annual Washington International Horse Show. WASHINGTON, September 14, 2015--Enjoy top international show jumping, Shetland Pony Steeplechase Races, group contests, new prizes and more! WIHS Sponsorship Coordinator Position Now Open! Intern with WIHS and develop your professional skills at the top level of equestrian sport! WASHINGTON, March 16, 2015--The qualifying period for the 2015 WIHS is underway. See who's on top as of 3/13/2015. Apply today for an opportunity to join this great group of equestrian teens. Austin Kiplinger, Chairman Emeritus, remembers the early days of the Washington International Horse Show.